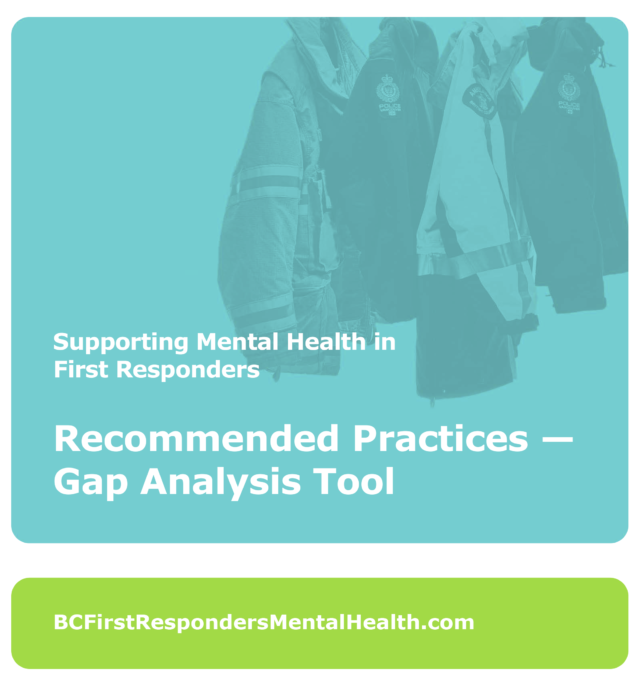 The BC First Responders Mental Health Committee, consisting of representatives from fire, police, paramedic services, and WorkSafeBC, has developed recommended practices for first responder organizations to better support the mental health of their employees. These 26 practices are described in the document Supporting Mental Health in First Responders: Recommended Practices. To accompany these recommended practices, the gap analysis tool in this document has been developed to assist you in implementing the 26 practices in your organization. The tool enables you to see what parts of the practices your organization already has in place and to track progress as you implement these. It also helps you to communicate to senior management where your organization is at currently and to show your progress to them.